A group of students interrupted the program and shouted their protests so much so that the program had to shut down for a couple of minutes. When they returned the students were no more. The presenter, Tony Jones, said such things as “enough, you are not doing yourselves any favours” and shook his head. He also said “This is not what democracy is about”. The students’ target was the Australian education minister, Christopher Pyne. This man was the most disruptive person in the previous parliament. Since being minister for education he has completely disrupted the sector with all sorts of wild ideas and has signaled that higher education is to move even more to a full user pay system along the lines of the US system. The fact that his generation had the benefit of what was then Australia’s free higher education system just does not influence the thinking of politicians such Christopher Pyne and co. I am one who strongly believes in democracy. I also believe that while Australia is way ahead of others when it comes to democratic processes, the reality is that our system of politics in Australia is off the rails. It has been damaged by recent politicians and the media, including the ABC. The situation has been brought about by media moguls, big corporates and the current group of elected politicians, the majority of whom hold no firm convictions except to do anything to be in power and to maintain the privileges of the corporate sector. Student protest are no longer viewed as part of the current democratic process in this country. My surprise is that this event happened at all. The general reaction has been that such a protest is not viewed as that part of the democratic process whereby groups vent their frustrations given their limited ability to do otherwise. It is my opinion that too many voices of dissent and questing have been silent in Australia for far too long. The norm has become to not speak up, not get involved and to sit back and enjoy the great Australian way of life. Sadly as this acquiescence has been encouraged over the last decades, the conservative forces have slowly been working away to undo Australia’s envied social, education, medical and justice systems. On that panel was the ever-present representative of the Institute of Independent Affairs (IPA). They are constantly being asked to appear on these programs by the ABC. The IPA is funded by all sorts of mysterious sources which would have to include all the usual suspects, Big Coal etc. Yet they never declare this. More seriously the ABC does not ask them to declare their interests before they speak on various social and political subjects. With all the cards stacked against their right to be heard, why wouldn’t the students – and others – feel frustrated and take any opportunity to voice concerns. The sad part is that people such as Christopher Pyne are Teflon coated to all voices of difference. He laughs them off and carries on. He is indeed strange for all sorts of reasons. The students had the right as part of our democratic process to take this opportunity. The disruption caused no more of problem than to take over about five minutes of the program. No great loss there as the program, while lauded by a few as being important, is usually very predictable. The questions are heavily vetted. The politicians or their stooges usually simply voice their party’s ideological lines and provide no real debate. The good programs are when there are more independent commentators and thinkers; or even better, when there are no politicians. Then real debates actually happen. The students, having made their point, were asked to leave. That’s fine. The program then continued. It was boring. It often is. 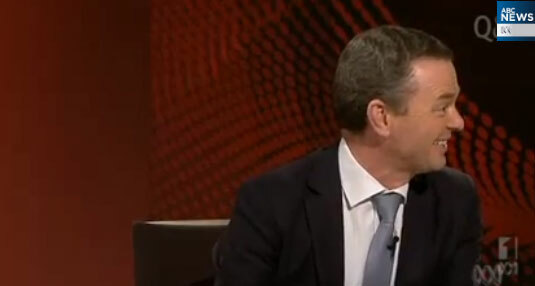 I switched off as I did not want to hear any more of the Pyne and IPA selfish points of view. The students have since produced a YouTube video to explain their actions. Wow! Don’t they look like a nasty bunch of radicals. Well done to all of them. Democracy wins – for a moment. And may a big poo fall on the head of Tony Jones for his patronising response. As for Christopher Pyne? The more that dangerous fool is ignored the better.